Why LinkedIn Endorsements are a good idea, gone bad. A few months ago, LinkedIn celebrated 1 billion endorsements by releasing an infographic (see below). Considering the passage of time and the increasing velocity of endorsement giving, this number may be over 3 billion by now. On the face of it, LinkedIn Endorsements seemed to be a good idea. Users can endorse specific skills of others, thereby helping potential employers to more easily shortlist candidates (the ‘placement’ market is after all, the main revenue stream for LinkedIn). Users will also benefit from ‘social recognition‘ of their skills and capabilities. A user does not necessarily have control over what skills are being endorsed by others. Thus a skill which one does not wish to emphasize might get ‘suggested’ by LinkedIn for endorsement by others, while the skills a user has selected as part of his/her ‘online brand’ are not always visible. While a one can opt not to display a particular endorsement, the overall result is either a wasted endorsement or dilution of the personal brand. As per the current implementation, anyone can endorse any skill for any connections on LinkedIn. As a result, one may get endorsed for a particular skill by someone who is not is a position to make a genuine evaluation of the skill. For example, a Scientist’s mathematical skills can be endorsed by his/her basketball teammate – not exactly someone who maybe in a position to make such a judgement. Alternatively, one might get endorsed for a skill that one does not possess [In jest, I’ve received an endorsement for Quidditch! Unfortunately, I cannot tell a Quaffle from a Bludger]. When combined with the fact that there is no way to verify endorsements, this results in the value of a LinkedIn endorsement being zilch. There was a time when one could view the LinkedIn activity stream and garner the major happenings in one’s professional network. Who changed jobs, who got promoted, who started something new. Now, the stream is largely unreadable, with the majority of updates simply stating that X got endorsed by Y for a skill Z. Which has made the LinkedIn Activity Stream unusable. The advent of Facebook and other online social networks has made the Dunbar Number a well known concept. This article provides a nice layman’s explanation of the Dunbar number, in the words of Robin Dunbar himself. The article also points out that recent research shows that while people can have several thousand Facebook or Twitter friends, the number of people with whom they have meaningful interactions remains at around 150. It seems as though the concept of a ‘Technology Assisted Dunbar Number’, which I had attempted to conceptualize 5 years ago has not found empirical support – as of yet. Hope remains that technology will one day enhance the limits of human cognition and thus enable us to evolve beyond this natural barrier. Over the past two decades, he and other like-minded researchers have discovered groupings of 150 nearly everywhere they looked. Anthropologists studying the world’s remaining hunter-gatherer societies have found that clans tend to have 150 members. Throughout Western military history, the size of the company—the smallest autonomous military unit—has hovered around 150. The self-governing communes of the Hutterites, an Anabaptist sect similar to the Amish and the Mennonites, always split when they grow larger than 150. So do the offices of W.L. Gore & Associates, the materials firm famous for innovative products such as Gore-Tex and for its radically nonhierarchical management structure. When a branch exceeds 150 employees, the company breaks it in two and builds a new office. For Dunbar, there’s a simple explanation for this: In the same way that human beings can’t breathe underwater or run the 100-meter dash in 2.5 seconds or see microwaves with the naked eye, most cannot maintain many more than 150 meaningful relationships. Cognitively, we’re just not built for it. Dunbar actually describes a scale of numbers, delimiting ever-widening circles of connection. The innermost is a group of three to five, our very closest friends. Then there is a circle of 12 to 15, those whose death would be devastating to us. (This is also, Dunbar points out, the size of a jury.) Then comes 50, “the typical overnight camp size among traditional hunter-gatherers like the Australian Aboriginals or the San Bushmen of southern Africa,” Dunbar writes in his book How Many Friends Does One Person Need? Beyond 150 there are further rings: Fifteen hundred, for example, is the average tribe size in hunter-gatherer societies, the number of people who speak the same language or dialect. These numbers, which Dunbar has teased out of surveys and ethnographies, grow by a factor of roughly three. Why, he isn’t sure. Another link to the article is here. Key tech trends include wearable computing, contextual apps, big data and maturation of social networks. Futurologist Robert Scoble has predicted four major tech trends – wearable computing (see my previous posts here), contextual apps, Big Data (see previous posts here), and social network maturation. While these trends will surely change commerce practice in the coming years, the nexus of these trends will be immensely disruptive. Think convergence – contextual apps on wearable computers that provide services based on real-time analysis of social and location data, delivered via omnipresent wireless internet access. The “open world”: Android’s relative openness has encouraged “contextual apps” to emerge from the woodwork. “Apple doesn’t let them [developers] talk to the WiFi radio or bluetooth radio,” said Scoble. Weird databases and the rise of “big data”: “We are seeing weird databases spring up like mushrooms,” said Scoble. These include NoSQL, Firebase, and MongoDB. The maturation of social networks: The leading social media sites like Facebook, Twitter, and LinkedIn are accumulating a massive store of user-generated data. What will they do with it? Facebook is giving away Rs. 50 worth of mobile talk time (minutes) to new mobile users in India. This pilot scheme was launched last week and offers the give away as part of a referral program. Many have suggested that this may lead to a flood of fake Facebook profiles – however, it seems that there are sufficient preventive measures in place. Instead, this is a clear play by Facebook to increase its penetration of the nearly 1 billion mobile user population in India and comes on the back of earlier offers of free Facebook access. Will it work? This is a long term play – don’t expect a bump in share price due to this in the short term. Scheme is only for new users and not for existing people on Facebook and is valid for registrations through mobile only. New user has to registers himself/herself to Facebook through mobile using the URL – m.facebook.com/tt. 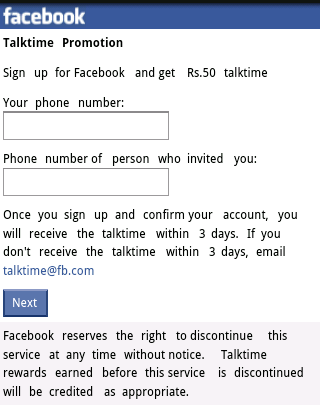 After registration he/she has to provide his mobile number on the Facebook Talktime page. Once you sign up and confirm your account, a talktime of Rs. 50 will be credited to his/her account within 3 days. Company pages goes mobile: Find out which connections work at the companies you care about, see recent news and updates from the company, and learn about current job openings. Don’t want your employer to know you’re looking? : We’ve recently added access tojob listings and jobs you may be interested in directly within your mobile update stream. Clearly, LinkedIn is doing better on the mobile platform (23% of LinkedIn users use its mobile apps) and on its ability to monetize its user base (for now). This is reflected in the rising share price – this wonderful chart by statista.com clearly shows that LinkedIn is thriving, while Facebook crashes (see the original chart here). And what about Google+? 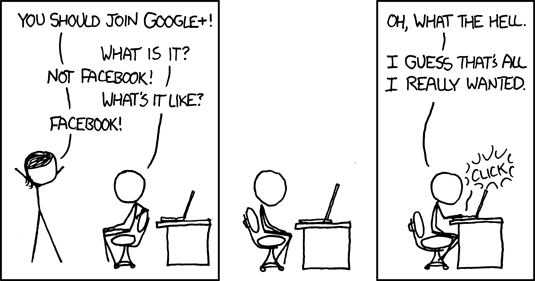 Well, this comic by xkcd says it all. Twitter and Facebook are blamed for being the catalysts of recent (good and bad) events – cue the happenings in Egypt and the recent tidings from India. Whatever be the impact, social media has become a major means by which the voices of people are heard, and primary means to news (which at times is spread faster) for many. This infographic, at open-site.org, nicely captures the social impacts of social media, or the power of the internet community. Is it really doomsday for Facebook? Several issues are depressing Facebook’s stock price, but there seems an upside that the market is not tuned in to. Facebook’s plummeting market value has been a major talking point of late. Its share price recently fell to below half of its IPO level and the doomsday forecasts are arriving thick and fast. Most analysts suggest that this is due to a combination of factors – expiry of a moratorium means that insiders are flooding the market with stock; Facebook is barely meeting its revenue and profit guidance numbers; and, the market is adjusting to the ‘real value’ due to reduced future expectations . Decelerating growth in users, unfavorable change in user mix, and a question mark in ARPU. In the short term, Facebook is certain to grow, but the question of Inferno vs. Paradiso will take quite some time to sort out. Facebook’s major user growth in the coming years will occur in developing markets – where average revenues per user are traditionally much lower as compared to developed markets. Another major trend is the the movement of users to mobile platforms. It seems clear that Facebook’s future (or at least future stock price) is dependent upon its ability to monetize its mobile and developing world users. Or is it? You are deciding where to get lunch. You launch the FB app, and use the smartphone camera to view a restaurant. The image is augmented by a bubble which states that 78 of your FB friends have recently been to the place, 80% of whom rate it 4+ out of 5. The app also says that if you eat there today, you will get 10% off your bill in the form of FB credits. How does Facebook make real money in the scenario? By taking a cut on the sales of FB credits (for example, $1 = 1 FB Credit, but you can buy 10 credits from Facebook for $11 and sell 10 credits back for just $9). However, these are big IFs and THENs.